Atrial fibrillation occurs when the atria in the heart quiver, rather than contract and beat. 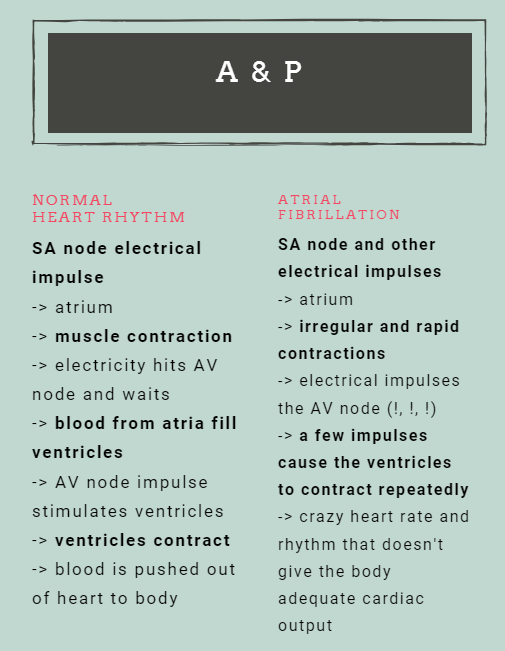 Instead of a normal and perfusing heart rate of about 80 beats per minute, the person gets a heart rate of roughly 200 beats per minute (atria can beat up to 600 times per minute!) and starts showing lack of perfusion. includes hyperthyroidism, pneumonia, heart valve disease, high blood pressure, cardiomyopathy, and age. Reversal of the cause will not usually resolve a.fib. can range from none to cardiac output decrease with manifestations such as chest pain, shortness of breath, and dizziness. Fast rates must be controlled. Usually a medication like cardizem is used intravenously to achieve results fast. 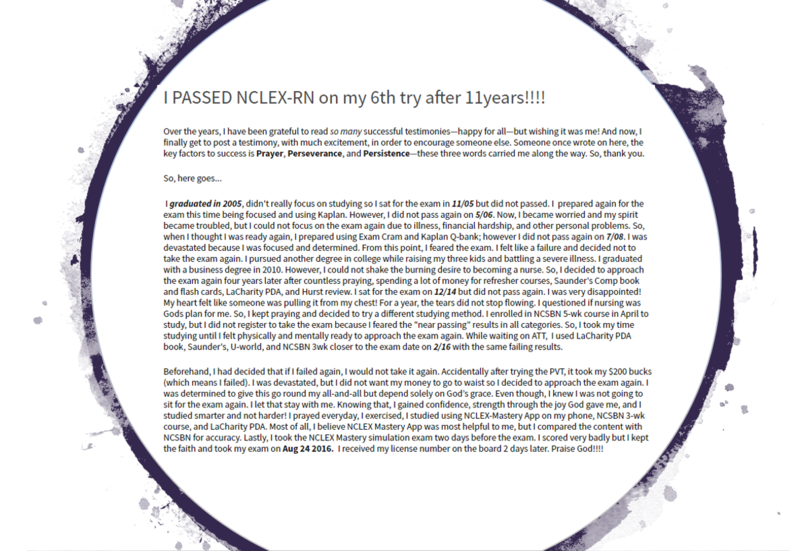 Many people will convert to NSR within 48 hours of medication therapy. Persons with atrial fibrillation are discharged with a medication to control the heart rate and one or two to prevent clots. Anticoagulants are used, like warfarin, Eliquis, aspirin, clopidogrel, dabigatran, or rivroxaban ( as seen on TV!!!! ). Rate & Rhythm controlling meds that might be used include amiodarone, Betapace, Tambocor; atenolol, metoprolol; diltiazem, verapamil; digoxin; Tikosyn. Cardioversion may stop the extra electrical impulses and restore a normal rhythm. If someone has been in a. fib. for an unknown time, cardioversion may not be an option due to the risk of moving clots from the heart. Ablation can be used to either burn (radiofrequency ablation) or freeze (cryoablation) abnormal electrical impulses. Maze surgery – the name says it all. A new maze of electricity is created for the heart. 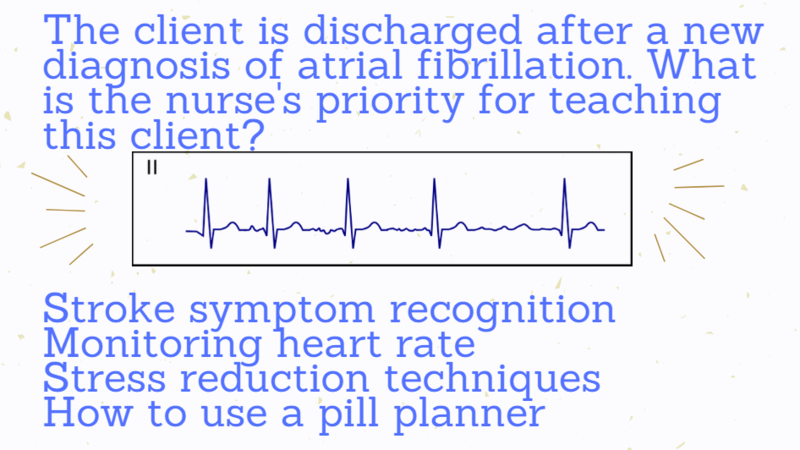 Almost all nursing interventions for atrial fibrillation come down to maintaining cardiac output. When the person comes in with atrial fibrillation with rapid ventricular response, an IV infusion of cardizem is going up immediately. A cardiac monitor at bedside is essential to keep an eye on the rate. Too high? Titrate up the infusion. Too low? Titrate the infusion down. Is the heart rate crazy enough to cause the person’s blood pressure to dip? The nurse fixes that, often with another infusion that will need titrating, too. Also watch labs like cardiac enzymes for trends indicating heart damage. This may indicate quicker or more aggressive action is needed. The client is discharged after a new diagnosis of atrial fibrillation. What is the nurse’s priority for teaching this client? If the nurse can only get one thing through to the client, it has to be how to recognize a stroke. Client’s often do not understand how to monitor heart rate, stress reduction techniques can take a long time to make habit, and people can certainly take their medications correctly without using a pill planner. Though the nurse should also emphasize not to skip doses of medications and the results and possible complications related to skipping doses. It was a very refreshing topic on Atrial Fibrillation. Thank you. Thank you so much! Glad you found it useful. This is beautiful.I work in an observation unit and this is very helpful. Excellent to hear that this is useful in your practice! Thanks so much.